The trouble with being Pixar is that your biggest competition is often your own fabled past. This is a company that has done so much right for so long that viewers have justifiably high expectations for every film they release. What would be a masterpiece production for most any other studio is often a mediocre title amidst the Pixar catalog of excellence. Thus is the case with Cars 3. The piece does a lot of things right except for one minor detail – it follows the films of the franchise that precede it. While it is arguably more grounded and meshes better with the rhythm of the first film than it does the genre mismatched Cars 2, that isn’t to say it’s a triumph either. In fact, a strong argument could be made that it loses the most ground to its own themes and agendas. But we’ll get to that. 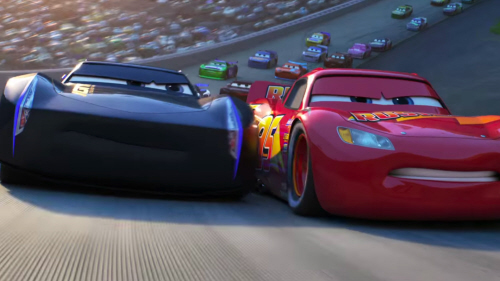 Built upon a budget of $175-million, Cars 3 comes in at a run time of 102 minutes. It grossed roughly $383m at the worldwide box office. 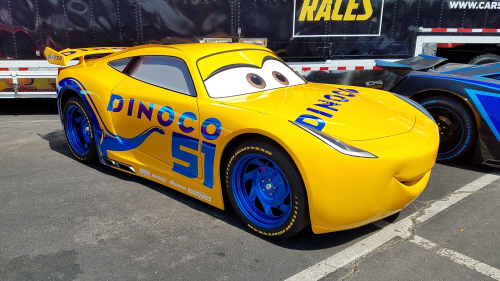 Cars, from a critical standpoint anyway, has always been a bit of a dark cloud for Pixar. 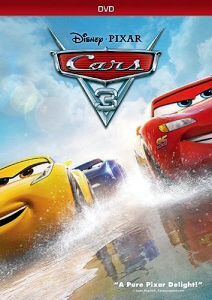 In a time when Pixar was still the literal golden child of the media, Cars was met with lackluster reviews. By the time Cars 2 came along, Pixar was no longer the media darling it once was, marred, as it were, by a few missteps with film along the way. And that film was met with even worse reviews. Here’s the rub though – both movies made a fortune anyway! Kids, with their Lightning McQueen backpacks and Mater lunchboxes could hardly care less about the fact that the whole universe of Cars really makes very little sense. Sure, they tried to go for the Toy Story anthropomorphic inanimate object angle but you had humans in Toy Story. Theirs was a tale of what may be happening when no one is looking and that’s what made it brilliant. Cars, on the other hand, foregoes the human element entirely, instead giving us an entire world made of sentient automobiles, tractors, forklifts and so on. For some reason this world mimics our own on down to things like door handles and steering wheels. If there aren’t any humans to ever operate these machines then why do they… Eh it doesn’t really matter. The kids who adored these movies didn’t care and clearly Pixar doesn’t either. They want the viewer to get swept up into the story arc of these beloved characters and accept it all at face value. And that worked in the first one. It sorta works in the second but here in the third, even if your main focus is the characters and their arcs, things get a little ugly. The story this time tells us pretty early on that Lightning McQueen’s days as a front runner are dwindling to an end. That, in the world of competitive sports, all rookies eventually become veterans and those veterans are replaced by a new field of rookies. By itself this is a wonderful theme for the Cars central arc. It’s a sad reality of the cycle of life. But what we get as a replacement is where the Disney agendas start to rear their subliminal but undeniable ugly little head. We’re introduced to a new female car by the name of Cruz Ramirez this time around for the obvious purpose of McQueen’s passing the torch/ going from racer to mentor much in the way Doc Hudson did for him initially. And while I personally have no issue with their collective decision to attempt to swap genders on the franchise’s lead character, it’s when you step out of the colorful world of Cars and look at parent-company Disney’s recent meddling with brands like Star Wars in our world to realize the rapid transition to female leads isn’t simply a case of organic story telling as it is a very deliberate shake up of the status quo. The whole element would be a lot more forgivable here were it not so unabashedly forced down the viewer’s proverbial throat. Cruz is repeatedly dismissed throughout the film with gender being a catalyst. In the end I suppose we’re supposed to cheer for the fact that she can, in fact, become a racer like the boys but if you think about it- the fact that there is sexism in the first place in the world of anthropomorphic cars is more disturbing then any happy ending can validate. If you can get past the subtle themes and not-so-clever political correctness Disney has been trying to slide into all of its productions of late, there is still some entertainment to be had in the franchise’s staple elements: Beautiful textures and environments, clever scripting and some intense racing sequences. In a lot of ways Cars 3 is a metaphor for Pixar itself. They themselves went from promising rookies to veterans and have internally passed the proverbial torch to the younger generations who will inevitably take over before they themselves are replaced by the one beyond that. One hopes that as these transitions conspire, the future producers of the Cars franchise will remember that it wasn’t politics that got them to where they are; that it was good story telling with characters we could get behind organically that did the job. Which is why this film’s near omission of Mater is all the more unacceptable. Disney would rather that you forget about its early years in the CG animated feature film game. As ludicrous as it seems now, there was a time when the big D through this computer generated stuff was neat to look at but little more than a passing fad. Sure Pixar was delivering golden egg after golden egg but they still believed the real bread and butter would come from the tried and true 2D pictures. One need only look at the material they were farming out in those early years to discover their heart wasn’t really in it: The Wild, Valiant, Chicken Little. Then something big happened. They almost lost Pixar! By the time that assimilation was complete, the writing was on the wall. 2D would always have its place in the world but the CG stuff wasn’t only here to stay, it was now the market. And though they absorbed Pixar into their ever-terrifying collective, they have been careful about keeping the two brand identities separate. Moana is a decidedly Disney production; which, in case that doesn’t tell you anything means this: Like Tangled and Frozen before it, this is the modern Disney “classic”. It hits all the marks; the princess, the colors, the musical element. By and large you can substitute environments and set ups between them all and still come away with the same ending. These are the films that Disney’s marketing department makes darn sure you can’t avoid. Your kid’s backpack, bed sheets, coloring books, socks, folders, toys so on and so forth. That being said, Moana is the 2016 computer generated animated feature film (Disney’s 56th animated movie) coming in a run-time of 107-minutes built upon a budget of $150-million. It managed to gross over $643m worldwide by the time it completed its theatrical tour. It was nominated for a pair of Academy Awards; Best Animated Feature and another for Best Original Song (“How Far I’ll Go”). 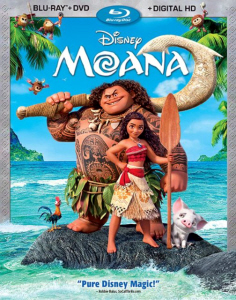 The story tells of Moana, the strong-willed (Disney Princess) daughter of a chief of a Polynesian village, who becomes chosen by the ocean itself to reunite a mystical relic with an elemental goddess. When a blight strikes her island, Moana sets sail, despite her father’s forbidding, in search of the mythical deity Maui, in the hope of returning the heart of Te Fiti and saving her people. The pacing of the film is sharp and crisp, bogged down only by the frequent intrusion of the musical numbers, some a bit more naturally transitioning than others. The visuals too are quite nice from the texturing of the ocean (not just the water but the anthropomorphic characters of the ocean) to Maui’s tattooed skin. 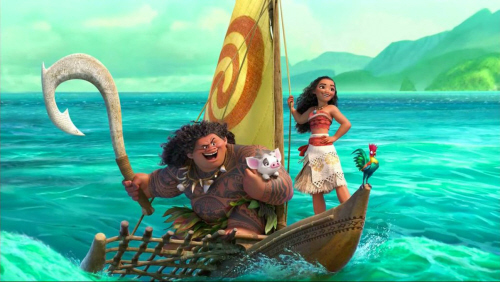 The plot is fairly predictable with a few odd twists and turns along the way (like the giant singing crab played by generally exquisite Jemaine Clement and an oceanic battle with painted coconut pirates) but the real star of the show is the dynamic between Moana and Maui. We get the idea that Disney is a big fan of empowered women but not unlike Tangled before it, the formula works best when played off a male counterpoint to offer contrast. Fortunately the egotistical and oversized (like literally, think small car here) living legend Maui, complete with conscience in the form of his animated life-experience tattoo. These are some of the more natural and comedic exchanges throughout the film as the two oppositional personality traits learn to first tolerate then eventually care about the other. All in all, it’s clear that Disney hasn’t quite delved back into masterpiece territory with Moana the way Pixar has with Coco, or for that matter, even when compared to what they accomplished in Frozen, the truth of the matter is that this a very solid piece of entertainment and perhaps the closest they’ve come yet to capturing the sensibilities and timelessness that has made many of their 2D films classics. It’s hard to downplay such things when talking about a company who once thought CG was little more than a passing fad. 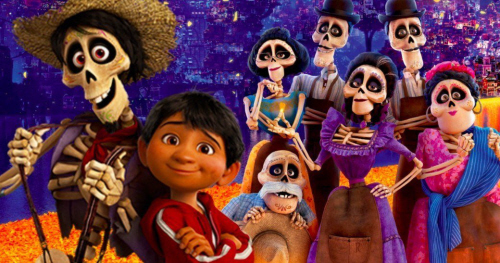 Should anyone doubt Pixar’s lasting impeccable impression on the CG animated film market they created, consider this: 2017’s Coco was built upon a budget of $175 million and managed a global box office return of $807.1m, was chosen by the National Board of Review as the Best Animated Film of 2017. It then won two Academy Awards for Best Animated Feature and Best Original Song (“Remember Me”). Finally it won the Best Animated Film at the BAFTA Awards, Golden Globe Awards, Critic’s Choice Movie Awards, and Annie Awards. They’re clearly doing something right even after all these years! Coco tells the tale of aspiring 12-year old musician Miguel and his Mexican family’s having forbidden all music. What starts out a fairly straight forward narrative quickly expands into a rich tale of family history, cultural flavor and the power of not only love but in remembering loved ones who have gone before us. Ordinarily this is the spot in the review where I go into detail with the plot but much like many of Pixar’s works before this one, a plot summary doesn’t do justice to what it is the film does best: Captures the highs and lows of the human condition and uses beautiful graphics, textures, lighting and music to present them to the world. 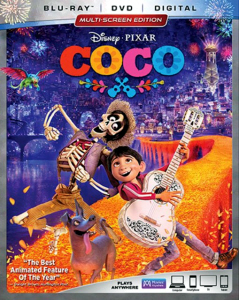 Much like how summarizing Up as a lonely widower flies his house to South America with a boy scout or Ratatoulie as a rodent lives his dream of becoming a chef, to call Coco a tale of a young boy who temporarily visits the land of the dead and discovers the realities of his own family tree is brutally understated. What makes Coco so endearing is how flawlessly it combines all of its carefully crafted elements into a single narrative that expands organically over its 105-minutes. It begins simple and small and continues to grow through its wonderfully fleshed out characters. Only in the end, looking back, does the reality that you had been told a fairly complicated tale become clear. I had reservations going in because of my appreciation for what Jorge R. Gutierrez (Reel FX) accomplished in 2014’s The Book of Life. Was it possible the world needed two computer generated feature films centered on family, life and death, the holiday of Día de los Muertos and presented in similar color pallets laced with Mexican-culture inspired visuals? The answer, surprisingly, is yes. Despite how it may sound, the two films approach so similar a subject with very different sensibilities. The Book of Life used a love triangle dynamic to emphasize the importance of bravery and being true to one’s self. Coco, conversely, works off the notion that long-standing grudges and personal betrayals can haunt us for generations if we’re not careful. Both are quite unique and spectacular in their own way. While I stand by the theory that good visuals do not a solid movie make, there is no getting around the fact that Pixar continues to lead the pack on what’s possible in the medium. Characters emote with gorgeous subtlety, textures and lighting are easily among Pixar’s finest to date and perhaps most impressive of all is the “camera work” itself; carefully emulating some of the finest techniques of the film era to make the viewer forget that he is, in fact, watching a piece of animation. All in all it’s no hyperbole to place Coco, named after Miguel’s great grandmother, by the way, among some of the staples that put Pixar at the top of the CG food chain in the first place. After a disturbingly long period of sequels, prequels and originals that weren’t all that memorable, it appears Coco serves to remind the world at large that the sensibilities upon which Pixar was founded are still alive and well. Even if proof of this comes to us in the form of skeletonized ghosts. From the very beginning the CG medium has proven itself quite capable of being used to shows us the “hidden world” of inanimate objects. Pixar did it with Toy Story. Garfield Gets Real did it with the newspaper comics section. Wreck-It-Ralph did it with video games. It was only a matter of time before some looked down at their smartphone and thought, yeah! How about a film about what’s going on inside here? As you might expect, concepts of a city-like circuit board (Textopolis), massive skyscraper-like apps and the little emoji populace being aware of their phone’s owner’s existence are all explored here. Almost directly from mediocre idea to corporate boardroom right on to the big screen. Presumably in that exact order. Built upon a budget of $50-million, the 86-minute 2018 animated feature film distributed by Sony/ Columbia Pictures managed to turn a very healthy profit: Nearly $87-million at the domestic box office and just under $217-million worldwide. This, despite critical disappointment. Let’s get right to it – this film is generally berated by critics and only slightly more appreciated by viewers but I’m of the opinion that a lot of that comes from it being an easy target. From afar the concept seems a little too obvious and once you enter into the world Sony created here, such concerns are confirmed almost immediately. They play it pretty safe, stick to all the contrived beats and take no chances. The story centers on Gene, the son of two meh emojis named Mel and Mary, who possesses the ability to make multiple expressions despite his singular blase’ purpose. In this digitally perfect world, such versatility is considered a malfunction, a glitch, and after Gene manages to screw up a pretty important text between the phone’s owner Alex and his crush, it’s off to the Apple store for a factory reset. Having established a timetable of impending doom, Gene and a few cohorts (obsolete Hi-5 and hacker Jailbreak) make a laborious trek across the phone and its myriad of apps to reach the safety of the cloud before its clean slate for everybody. 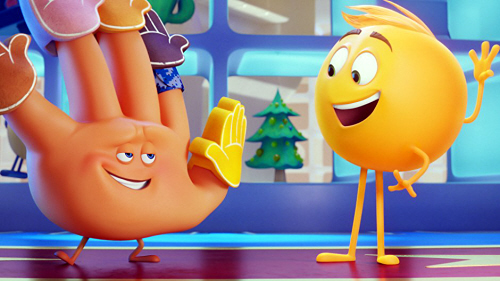 As far as I can tell, the main complaint centered around the disgust of this film is that it even exists in the first place; that the collective world did not need a story about an emoji learning to accept the fact that he’s unique. To a degree, there is truth to this. However, that’s not to say there are no comedic moments along the way. And somewhere deep inside, there are hints of better developed movies showing through. Pixar’s Inside Out cleverly demonstrated how the concept of a singular emotion could have trouble interacting with other emotions. And based on trailers alone, it looks like Wreck-It-Ralph 2: Ralph Breaks the Internet will very similarly show its protagonists visiting various apps and sites on the web in a populated digital world/ cityscape. It will be interesting to see whether critics who so harshly expressed the lack of logic in this approach here in Emoji will voice similar complaints in a film backed by the much more PR-heavy Disney. 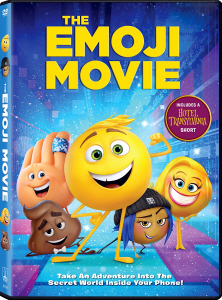 All in all, perhaps paying full theater pricing to watch The Emoji Movie could have been grounds for some justified complaints but now that it is available to purchase on the DVD/ blu scene, able to be rented and appearing as a stream option on many of the popular digital services, there are certainly worse ways to kill an hour and a half. Besides, say what you will about the lack of cleverness here but you have to admit, a few of the film’s tag lines were pretty on point: It’s Not Easy Being Meh & An Adventure Beyond Words prove someone involved in all of this had a sense of humor. I’ll come right out with it on this one- your love or disdain for this film will depend almost entirely upon your appreciation (or lack thereof) of the source material upon which it is based. Dav Pilkey’s immensely popular series of low brow comedic children’s novels of the same name aren’t only the inspiration for this piece, they literally ARE this piece. To DreamWorks’ credit, the art style, potty humor, meandering and sloppy plotting of the books are all duplicated here fastidiously. For better or for worse. 2017’s Captain Underpants: The First Epic Movie was built upon a modest (for DreamWorks) budget of $38-million. In fact it boasts the distinction of being the least expensive computer generated animated film in DreamWorks’ history. As such the relatively low gross of $125m worldwide still leaves this one in profitable territory. It also boasts the distinction of being the final DreamWorks production distributed by 20th Century Fox. The story, or what passes for one anyway, tells of two imaginative elementary school pranksters named George Beard and Harold Hutchins (voiced by Kevin Hart and Thomas Middleditch) who hypnotize their grumpy principal, Mr. Krupp (voiced by Ed Helms), into thinking he is Captain Underpants, a superhero who fights crime wearing only tighty whities and a cape, who just so happens to be the main protagonist of George and Harold’s comic books. Jerome Horwitz Elementary School, where the two lead characters happen to attend, is visited by a German-accented scientist named Professor Pee-Pee Diarrheastein Poopypants, Esq. (Nick Kroll), or as he calls himself for short; Professor P.
Captain Underpants (disguised as Mr. Krupp) hires him to be the school’s new science teacher. As it turns out, Poopypants is seeking to rid the world of laughter on account of the fact that people have made fun of his name for years. He plans to accomplish this by turning toilets into man-eaters and, oh it’s not even really important. Attempting to summarize this plot is nearly as foolish an ambition as is enduring it. The greater point here is the film’s narrative has been lifted from the books: hook, line and stinker. So what’s the experience of actually investing the 89-minutes required to watch the film in its entirety like? As an adult, it’s pretty rough. Not to suggest that the gags comprising most modern animated films are sophisticated per se, expect an entirely new level of potty humor meets slapstick with Captain Underpants (in the event that the title threw you off). To its credit, the film is about as close to being an animated version of the books upon which its based as I’ve yet to encounter. The bad news is that it includes a very sloppy sense of plot. Even if this were a genuinely plot-driven tale, the character narration directly into the camera and hobbled-together juxtaposition of segments really makes this feel as if it were edited by a couple of elementary school kids. And again, if that’s what the producers were aiming for here; nailed it. When I view a CG animated feature, I typically expect it to provide silliness and simplistic gags to keep the younger audience for which it’s intended amused while simultaneously offering a bit of more subtle humor that the adults who typically accompany the kids to these affairs can enjoy as well. DreamWorks, in my opinion, are the absolute masters of this unique blend of funny-bone tickling. Unfortunately, Captain Underpants’ reliance upon the source material pretty much limits the plot, humor, visual appeal and sensibilities to the younger end of the spectrum. 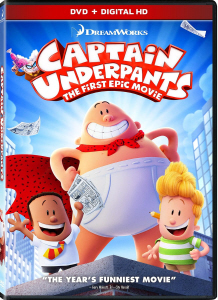 In conclusion, if your kid or even the inner kid in you happens to be a fan of Dav Pilkey’s Captain Underpants books (or the countless spin-offs they’ve inspired), this is the film for which you’ve waited. These guys captured even the smallest detail of the world Pilkey has created. If, on the other hand, you are considering it simply because it’s a DreamWorks animated feature and you enjoy their brand of humor, this may be one to skip. Not to suggest it’s a total turd but, on second thought, why not? That’s exactly how Harold and George would have wanted it. 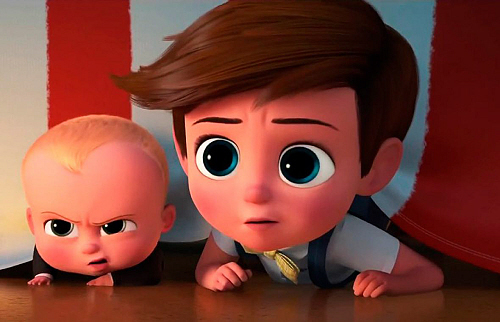 Even at first glance, The Boss Baby makes clear the fact that it could only have been the result of DreamWorks. It’s zany, it’s foolish but by the end it leaves its viewer feeling immensely satisfied. It’s always said mastery of any art is the ability to make it look easy to others. Taking a picture book about a kid brother showing up in a suit with a briefcase possessing the secret ability to speak and command other children and making that seem plausible, enjoyable and appealing to children and adults alike is no small task! Yet DreamWorks made it look easy. 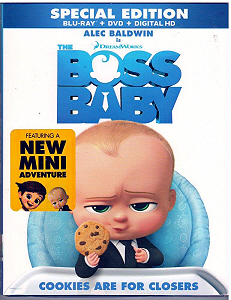 Based loosely on a short picture book of the same name from 2010, The Boss Baby is the 2017 97-minue long CG animated feature built upon a budget of $125-million. It managed to turn a nice profit at the domestic box office ($175m) but really shone globally; $528 million gross. The story is narrated by an adult Tim Templeton (Toby Maguire) and centers on his memories of being 7 and introduced to his younger brother (Alec Baldwin) AKA The Boss Baby himself. 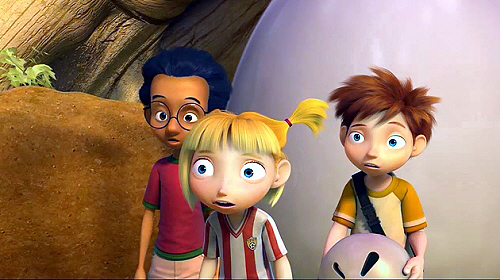 Often joked that the source material provided director Tom McGrath, perhaps best known for his work of the Penguins of Madagascar, enough inspiration for an animated commercial at best, somehow he and writer Michael McCullers manage to weave a rapid fire comedic tale of sibling rivalry at its most imaginative. Early on it is explained that young Tim always had a wonderfully overactive imagination, leaving the viewer to ultimately decide for himself whether or not the events upon which the film is centered ever really took place. As such some of the film’s most triumphant moments are those that transition between the perspective of the kids themselves and those of the partially-observing adults. My own favorite involved a big budget Hollywood chase sequence, complete with explosions and car crashes aplenty, as seen from the parents through the window as typical kids playing in the yard. Critics didn’t seem overly generous in their appraisal of this one, citing abundant potty humor and silliness as its primary faults; which is surprising. Ordinarily you’d expect a film about a cutthroat business elite toddler on a top secret mission from “Babycorp” to be very scientifically accurate. A good part of the appeal of the entire dynamic can be attributed to a wonderfully cast Miles Bakshi as young Tim Templeton. While you realize the catalyst of his whole tale is his jealousy for his baby brother, it’s hard not to root for him thanks to the multitude of manipulations inflicted upon him by the Boss. All in all, it’s hard not to appreciate the fact that McGrath and company were able to deliver a witty, comedic full length romp out of essentially nothing. Great casting, concise plotting, some humor for all ages and demographics and a story that brilliantly leaves the viewer wondering whether or not any of it happened in the first place are the reasons to ignore the critics and give it a look. Come for the silliness, stay for the nuances. If you went into this one expecting anything more, perhaps finding fault with the film should be the lesser of your concerns. Sony has been really getting their mileage out of their Smurfs license and with good reason. Given the success DreamWorks demonstrated with their Trolls, the potential for cheery mythical little forest-dwelling do-gooders is off the charts right now. Sadly Smurfs: The Lost Village manages to miss many of the marks that could have assured its place in animation classic-dom while reminding audiences that creating a zippy romp that holds the attention of the youngsters while simultaneously amusing adults is a lot trickier than it looks. Amazingly this is Sony’s fifth CG outing with the little blue guys but the first genuine fully computer generated feature film (prior to this there were two live action hybrids; 2011’s The Smurfs & 2013’s The Smurfs 2 as well as a pair of 2D cartoon hybrids; 2011’s The Smurfs: A Christmas Carol and 2013’s The Smurfs: The Legend of Smurfy Hollow). 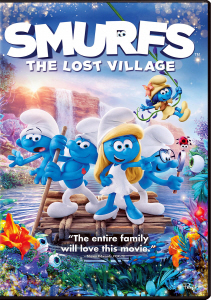 Smurfs: The Lost Village is one of those films that’s been floating around in movie limbo for a long time. Announced way back in 2012, it didn’t take long for prospective release dates targeting 2015 to begin getting pushed back. This tradition continued nearly all the way up to April 2017 theatrical release. Built upon a budget of $60-million (which can be considered modest only in this industry), the 90-minute film was written by Stacey Harman and Pamela Ribon and directed by Kelly Asbury. It failed to break even at the box office (taking in close to $46m) but would eventually prove very profitable in the global market; to the tune of nearly $200-million internationally. The story centers on the only female in the hidden Smurf village; Smurfette, who was actually created by the evil wizard Gargamel from a lump of clay, but later redeemed by Papa Smurf. In the quintessential search for meaning catalyst, she ventures out beyond the gates of the secluded village and happens upon the discovery of lifetime: an entire village of female Smurfs. If the goal here was to provide her some comfort via posterity, the writers really failed to convey the message. Rather, we are treated to what amounts to a lengthy display of animated feminism/ female hubris that ultimately leads to a rather disturbing death-sequence climax and magical resurrection (happy) ending. Your lowly reviewer may not be qualified to make such screenplay-derived observations but I am left feeling like a golden opportunity was missed in all of this. Wouldn’t it have been far more clever to have the all-female Smurf village serve as a sorta inverse of the village we all know and love? Perhaps they have a single male Smurf there (created from a lump of clay by an evil female wizard) who could provide Smurfette with some genuine empathy? Then perhaps for the big ending, the two lonely wizards could have come together in their respective obsessions and found love? In any event, the lack of cleverness in the plotting is merely one of many issues. Owing its roots to the popular 1981 Saturday morning cartoon series, many of the casting choices here feel quite lackluster. Gone is Smurfette’s famous raspy note in favor of a much more “modern girl” rendition from Demi Lovato and Gargamel is brutally underplayed by The Office’s Rainn Wilson. Additionally the gags for which the Smurfs franchise was known are present, especially early on, but feel rather forced and recycled here. While 90-minutes is hardly enough time to build a genuine sense of character development, the entire film plays more like a typical weekly episode of the series than it does a stand alone feature. 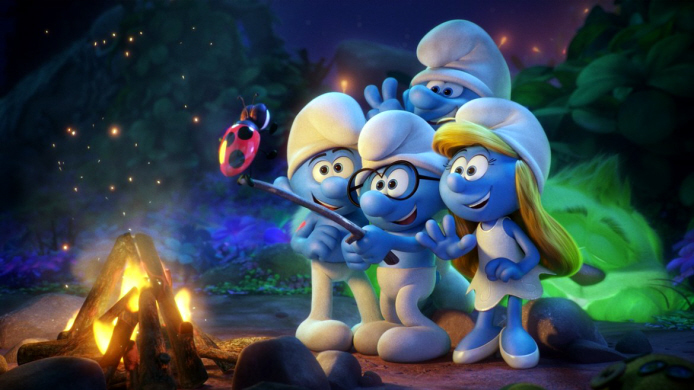 In the end Smurfs: The Lost Village doesn’t commit any major crimes so much as it fails to inspire much of anything. 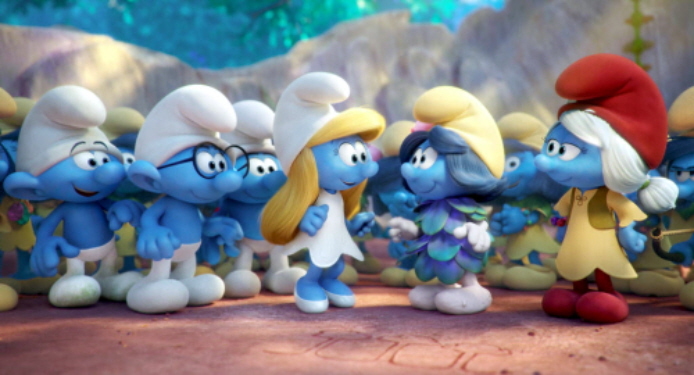 The plot struggles to offer any lasting value or cleverness, the personalities of the Smurfs are shallow and forgettable and the opportunity to integrate some layered wit to keep the adults entertained is all but absent entirely. I’m of the opinion that The Smurfs is a lasting franchise with limitless potential for the computer generated medium. They are colorful, lovable, and steeped in a world of magic and mystery. Hopefully some more clever scripting and a stronger plot can make potential sequels more memorable. The last thing one expects a film about bright blue little creatures in a colorful forest to be is dull. At a glance Agent FOX bears a striking resemblance to Disney’s blockbuster Zootopia. We have a city full of anthropomorphic animals, a case study on the tumultuous relationship between foxes and rabbits, we even have a possibly-corrupt government system driving the motivations of the lead characters. However, that’s where the similarities between the two films end. 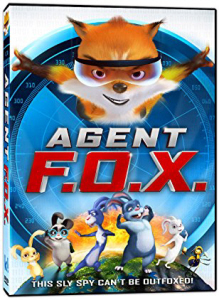 While Zootopia brilliantly shrinks the world in which we live into a microcosm of accuracy and brilliance, Agent FOX takes the same initial elements and garbles them up into a collection of scenes held together by terrible acting and a senseless plot. Of course, these harsh assessments apply to the direct-to-DVD English dub of the film; the original Chinese movie upon which it’s based may well be a masterpiece. 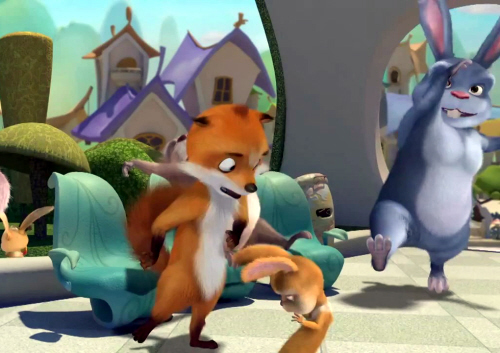 That said, 兔子镇的火狐狸 also known as The Firefox of Bunnington Burrows is a Chinese 3D computer animated fantasy adventure film directed by Ge Shuiying. It was released theatrically on October 30, 2014 in both 2D and 3D. On July 1st, 2014 Kaboom Entertainment released the DVD version being reviewed here domestically. It comes in at a run-time of 83-minutes. The story here tells of Agent FOX (Shannon Settlemyre) having been sent to Carrot Town via a hot air balloon shaped like a giant cat head (nothing high profile about this) to find a lost artifact, the guardian amulet. Carrot Town, as you may have surmised, is a city full of rabbits. When he’s immediately found out, the residents confuse him for a long-tail rabbit cousin and he goes along with the tale, pretending to have lost his memory so that he can hang around and seek out the amulet. As he lingers on in C-Town, he begins to learn lessons from the creatively named Elder (Anthony Yeager), becomes friends with equally craftily named Princess Bunny (Ashley Bril), and shares his invention skills with a spider professor named… Professor Web. Along the way the production team tries every trick in the book to make the piece somewhat endearing; from a strangely out of place emotional opening and closing narration (but who’s doing the speaking, I’m still not entirely sure), to an overacted vocal cast that manage to unintentionally remind the viewer constantly that voice acting is tougher than Pixar makes it look. As is so often the case with dubbed foreign films, the visuals here are not to blame for the film’s shortcomings. Everything is clean and well animated. The character models aren’t anything to write home about but they’re easily identifiable and get the job done. In fact they’re about on pace with what DreamWorks was giving us back in 2006 with Over the Hedge. Where things get ugly is the plot itself; namely the lack thereof. Rather than come off as a focused narrative or a comedic adventure story, Agent FOX meanders around with a plot that is, at the same time, overly simplistic and complicated. What’s actually happening is as simple as a story gets: The lead character is trying to find an object that he’s been ordered to find among a misunderstood society. What you think is happening is a lot more complex on account of a whole bunch of muddled elements like never revealing exactly what it is he’s after, what it does, why it matters. Worse still is FOX is ordered about by a faceless, top-hat sporting commander named Commander who, not unlike Dr. Claw from the old Inspector Gadget cartoons, is only seen on camera from the back of his chair in a control room. What’s wrong with this, you wonder? Well, nothing except that the character is so overacted and one-dimensional that any hope for genuine hero growth or realistic motivations because of his influence goes right out the window. Kids may laugh at the abundant slapstick or tune in (temporarily) because of the cuteness of the characters but it doesn’t take long for even the most nondiscriminatory among us to discover the painful pace of the plotting, the lack of story, the poor acting and the bland conclusion all equate to time better spent watching almost anything else instead. Upon first glance Trolls looks like it’s got all the tools to be something epic in the vein of DreamWorks films like Shrek: A classic fantasy element, great soundtrack, themes of love conquering all etc. 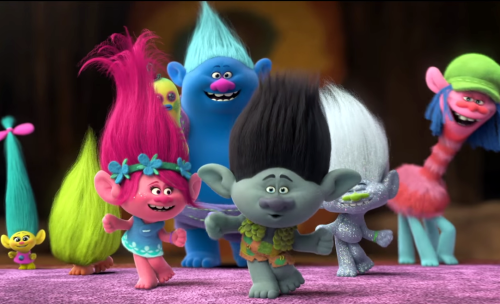 However, while some films become more classic-destined with repeated viewings, Trolls’ shortcomings become continually more apparent. But before we delve into such things, let’s take a look at the facts. 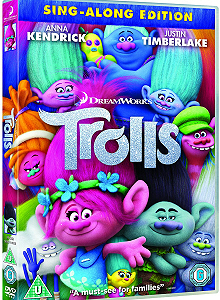 Trolls is a 2016 American 3D computer-animated musical adventure romantic comedy film based on the Troll dolls created by Thomas Dam. The film was directed by Mike Mitchell and co-directed by Walt Dohrn, written by Jonathan Aibel and Glenn Berger and based on a story by Erica Rivinoja. It is the 33rd animated feature film produced by DreamWorks Animation and was released theatrically in the United States on November 4, 2016, by 20th Century Fox. The film grossed $342 million worldwide (up from its $125 million budget) and received an Academy Award nomination for Best Original Song for Timberlake’s “Can’t Stop the Feeling!”. As is the case with most DreamWorks films that turn a profit theatrically, a sequel is in the works and scheduled to be released in 2020. The story here tells of two feuding mythical races- the trolls and the bergens. The trolls, in case their presence in pop-culture for multiple decades has somehow eluded you, are the tiny, bright, crazy-haired happy pencil-toppers while the bergens are the large, lumbering, warty double-chinned miserable creatures that, quite frankly, usually match the definition of a troll in any other mythology. Somehow in their sorted history, it was discovered that if a bergen ate a troll, they would temporarily taste their infectious happiness and developed an annual holiday around the capturing and eating of live trolls called Trollstice. The trolls have managed to keep themselves hidden from the bergens for 20 years, but when they hold a raging party that ends up giving themselves away, and the bergens go on a rampage, looking for Trolls to capture and chomp. From here it’s a search and rescue movie where trolls Princess Poppy (Anna Kendrick) and Branch (Justin Timberlake) go on a musically laced adventure in effort to free their captive friends before chomp time. Unfortunately the narrative itself lacks any real depth or cleverness, instead opting to flood its viewer with the strangely addicting combination of a color/ texture overload with solid renditions of many classic songs. Thankfully there is some DreamWorks-style attention paid to attempts at humor all throughout; one particular segment involving a striped gym-socks sporting cloud named Cloud Guy is almost worth the price of admission alone. Almost. At the end of the day, all of the pieces come together for the Shrek-style happily ever after even if much of the voyage itself is largely forgettable. The colors and music will be enough to keep younger kids entertained (assuming the whole “getting eaten alive” element doesn’t terrify them off first) and adults are sure to find themselves smirking at a few of the encounters along the way so long as no one goes in expecting Pixar-style heart or even past DreamWorks’ franchise cleverness. The experience of Trolls is a lot like getting full on cake- a little too sweet and hollow to be one’s entire meal. But then again it looks like like they’ll have a chance to redeem themselves for any shortcomings in this one come 2020. Might want to start skipping out on dessert now. I’ve gone on record countless times expressing my disappointment in the practice of taking a foreign CG film, slapping an English dub over the visuals and calling it a new movie. Sadly it happens far more often than most people realize; but they certainly discover why it’s so unsuccessful the moment they sit their kids in front of the screen with the DVD they rented from the Redbox. That being said, every once in a great while a CG film born of this tactic defies all the odds by being watchable- and even rarer still, dare I say enjoyable. 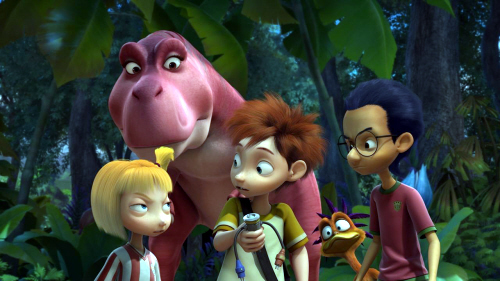 Back to the Jurassic comes to us by way of South Korea in the form of a 2012 computer generated animated feature film known as Dino Time. It comes in at a run-time of 88-minutes and, oddly enough, wears a PG rating despite being more all-ages-friendly than most domestic animated efforts of late. 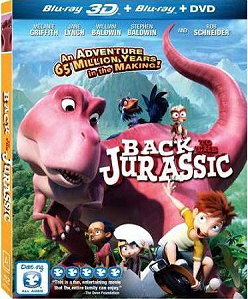 In any event, you have to give the English dub distributors (Alchemy) credit on their marketing strategy- this one was released 10 days before the blockbuster Jurassic World here in the US and, worse still, actually steals the tag-line from the original Jurassic Park film: An Adventure 65 Million Years in the Making. Let’s hope Universal Pictures is too busy to notice. Anyway, the story here tells of rocket-skateboarder and all around rebellious kid Ernie (voiced by King of the Hill’s Pamela Adlon) and his exploits in his fictional home town of Terra Dino. Ernie, like most of Terra Dino’s residents, is quite the dinosaur buff and, with nerdy best friend Max (Yuri Lowenthal) decides to go behind closed doors at the local dinosaur museum for a closer look at the bones they’ve been collecting. After a groundation that doesn’t stick, Ernie escapes to Max’s house where the two of them, along with Ernie’s sister Julia (Tara Strong) end up inside of one of Max’s dad’s (voiced brilliantly by Fred Tatasciore) inventions: an egg-shaped time machine. As you may have predicted, the trio find themselves in the Cretaceous (perhaps Back to the Cretaceous wouldn’t have allowed them to steal Jurassic Park’s tag-lines) and face to face with a mother T-Rex (Melanie Griffith) who, aside from being pink, seems to think the strange little mammals in her nest are her own hatchlings. Factor in a pair of evil two evil Sarcosuchus brothers (voiced by real-life brothers Stephen and William Baldwin), a wacky colorful dino named Dodger (Rob Schneider), a few gas-spewing simpleton prehistoric birds and you have all the makings of a colorful, silly romp. About the film’s greatest strength, aside from securing a surprisingly capable English cast, is an intelligently written script; especially in the early goings of the film. As in our time. Once the dinos enter the equation, things do take a step back in terms of humor, wit and plot strength but it is also likely the target age-group here will be much more forgiving. The visuals are bright and clean with nice character models and surprisingly adequate animation cycles. In fact, their ability to match voice with mouth flaps is also uncannily smooth throughout. Another one of those small details that goes a long way. All in all, Back to the Jurassic is simple, mindless entertainment that will likely appeal to kids for its linear plot and bright dinosaur models. Adults won’t be completely tortured as is so often the case with dubs; in fact, until the talking dinos portion of the show, there may even be enough wit to keep them smirking as well.